The glass series is an ongoing, experimental project with color. While most of my other work is now done in shades of white, I do love vibrant color. 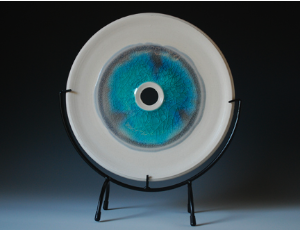 The bowls, plates, and decorative pieces in this series are created using brilliant splashes of glass, fused to the piece during the firing process, which radiates a dazzling spectrum of colors. 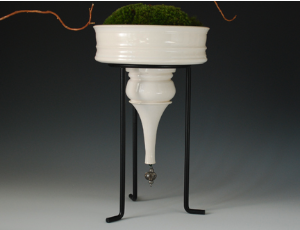 Finial planters, with romantic lines and a functional design, are handmade using porcelain and come in two variations: hanging or set within a metal pedestal stand. Sturdy enough for outdoors, elegant enough for indoors. 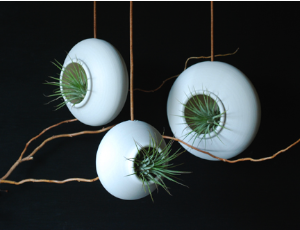 Great modern design for your air plants. I make two different styles of hanging air planters - the rounds and the teardrops. 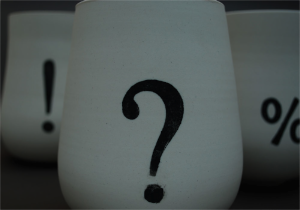 Both are handcrafted from fine porcelain.